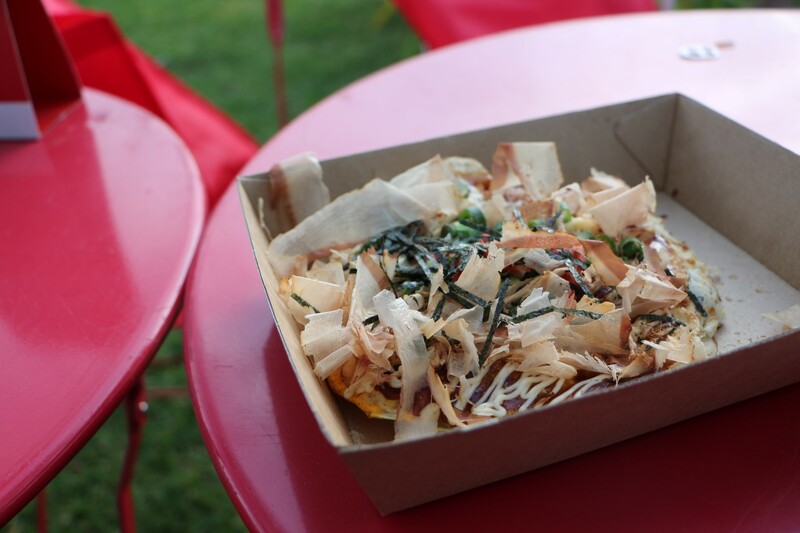 Presented by Zomato, we were treated to an evening of relaxed dining and entertainment, sampling some of the best cuisine Adelaide has to offer over a range of Asian cultures. The park was split in to different nations, providing a winding trail for hungry travellers. In each sector, there were food stalls (both one off dining experiences and pop up established restaurants) as well as traditional presentations of martial arts, dance and music – often in full costume. On the Saturday, there was a Cosplay meetup, which provided an extra splash of colour among the vibrancy of the evening. Having travelled to Japan in 2009, I was particularly ecstatic to happen across an Okonimayaki stall in the Japanese sector. Presented as an offshoot of Samurai Tepanyaki (located on the Parade in Norwood), I watched as my seafood “Japanese pizza” was made fresh on a hot plate before my eyes. Okonimiyaki is a traditional dish that allows the diner to choose from a variety of toppings to create an eggy, pancake like dish. Whilst this may sound unappealing to the wary eater, the taste is very much like an omelette; finished with Japanese mayonnaise and a sprinkling of traditional herbs. I decided to accompany the dish with the perfect antidote to the hot weather – a Kirin Apple and Peach cider. Also in the Japanese sector was a pop up stall from popular, contemporary Japanese restaurant Sushi Planet (on West Terrace). 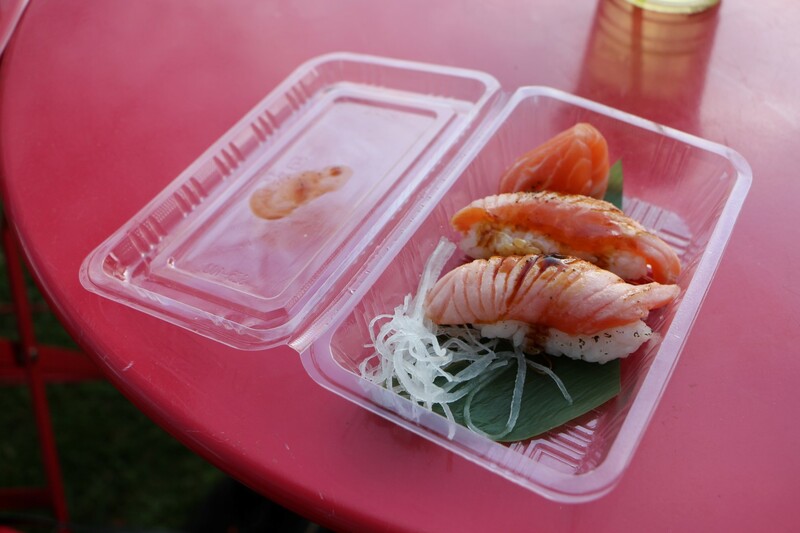 Mel chose aburi salmon and salmon sashimi which, presented in a plastic takeaway container, were provided fresh, flavoursome and downright delicious. Moving on to China, we were greeted by women in traditional dress. 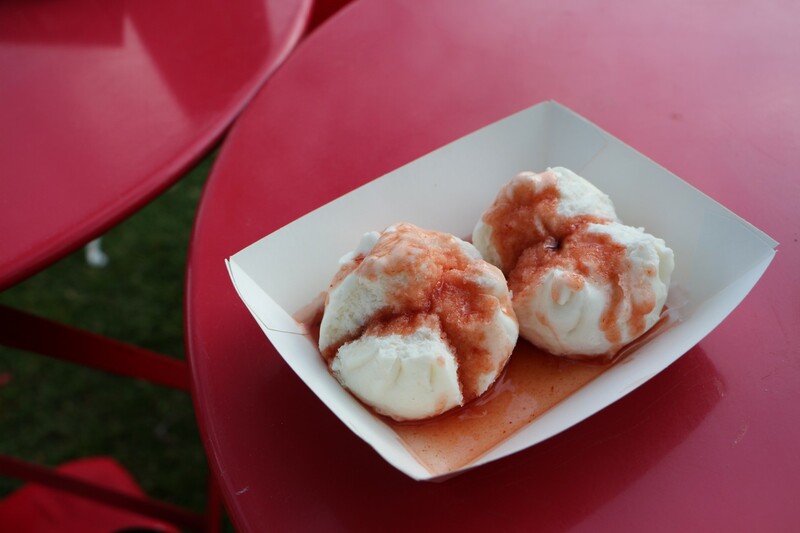 At Hutt Street’s Golden Dragon Yum Cha stall, Mel decided on steamed pork buns – commonly known as happiness in a dough. Accompanied by sweet and sour sauce and fluffy in texture, these buns never fail to disappoint with their strange mix of sweet and savoury. With our samples from China and Japan, we followed the path through to the Melting Pot sector. Combing cuisine from a variety of sectors in one easy location, the Melting Pot was a true example of the positive cohesion of culture. 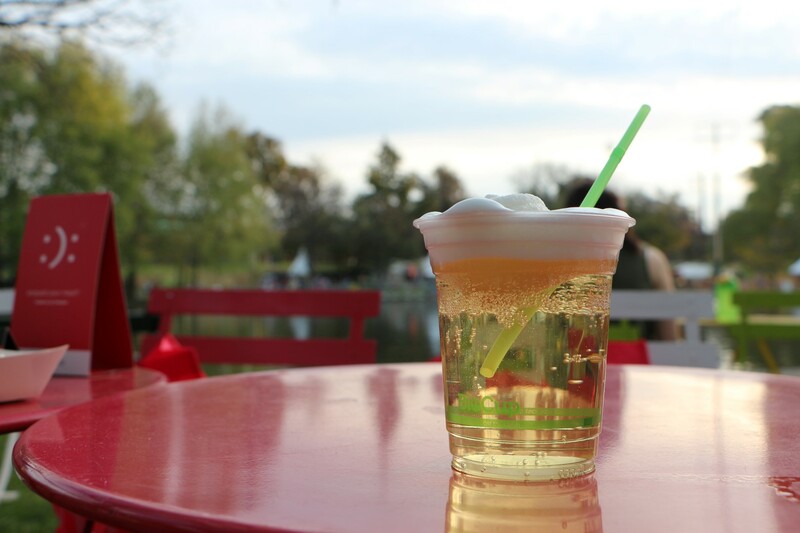 At Uncle Wang’s Grocery and Bar, we stumbled across refreshing beverages from The Frozen Beer Company – delivering exactly what the name suggests (as well as cider) on an evening that called for nothing more. 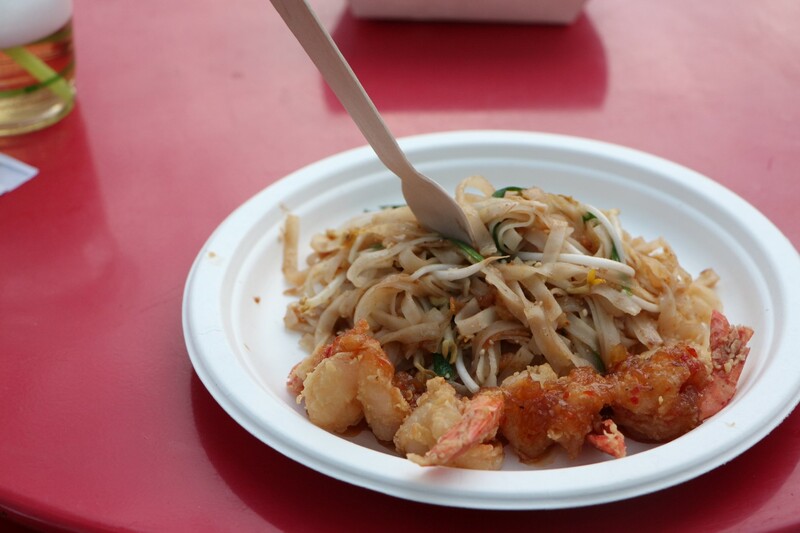 Our final culinary destination was in Thailand, where we settled on a dish of Pad Thai from the Star of Siam stall (originally located on Gouger Street). The noodles were sizzling away on the hot plate, ready for us to enjoy within moments and served with crunchy battered prawns. We sat as a collective with other bloggers and foodies from Adelaide, in a prime position overlooking the lake as the sundown burnt low into evening. We shared our food and our stories, as well as anecdotes about blogging and culinary experiences. After finishing our meals with bellies full from laughter and delicious food, we headed over to the big top to see the comedic show ‘Karate Chop Teriyaki’. Seated on round tables, we were waited on by professional Butler Steven Lawson (of Henry’s Professional Butler and Waitering Services), and treated to wine and beer on ice from Kirin. 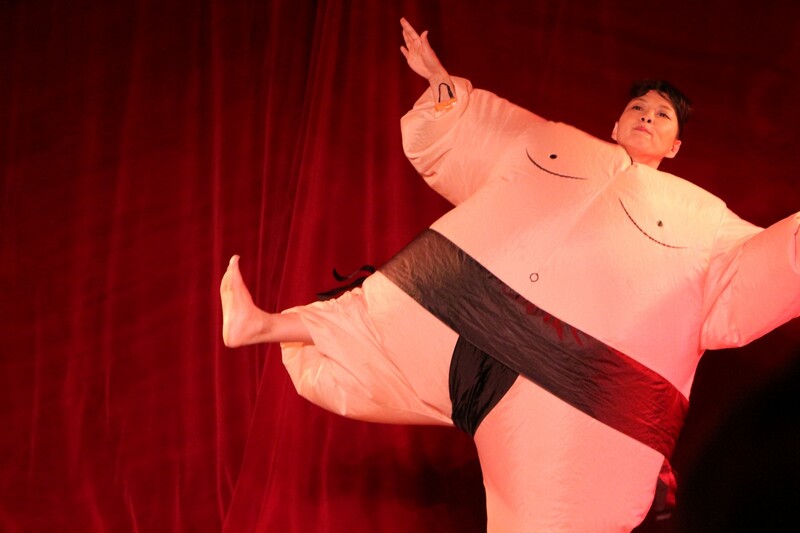 Karate Chop Teriyaki consisted of a troupe of three, all of whom were natural comedians, and weaved Japanese culture, slap stick, stand up and music into a 2 hr show. It was thoroughly entertaining, and a fantastic experience.